Keeping fit while at sea gets easier with all the elements offered to help – from state-of-the-art gyms to classes from A-erobics to Z-umba. 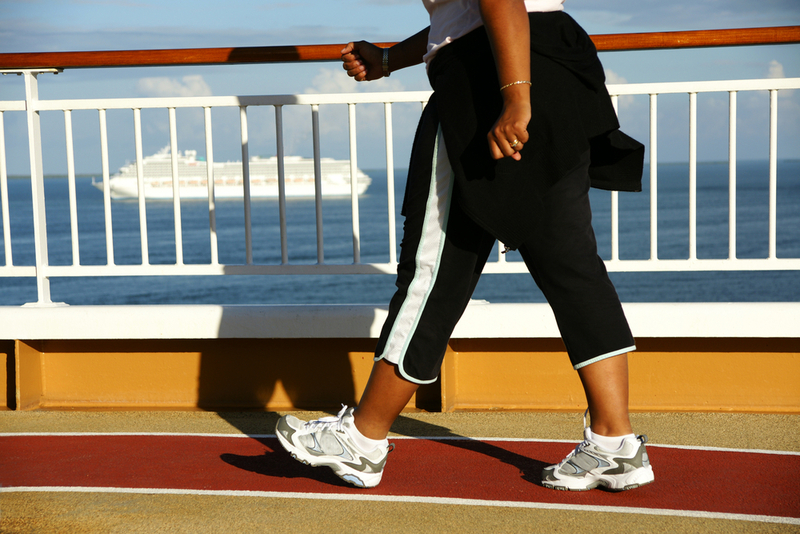 It’s one of the oldest clichés in the book – go on a cruise and say goodbye to health and fitness. Lie on your lounger and pile on the pounds. Well, those days have gone. Cruise companies have always been there to cater to their customers needs – and these days, those needs are increasing especially when it comes to health and fitness. Cruise passengers are well informed about health and have more than a passing acquaintance with what it means for them and their bodies. There isn’t a cruise ship afloat that doesn’t offer some well-being attraction from the simplest power walk around the deck to a personal trainer who will devise, or reboot, your own personal exercise programmeto be taken home post-voyage. But neither does this preclude you from enjoying the fruits of the chef ’s table or the joys of the top sun deck. What it does indicate is that many of us are using our holiday down time to think about our well-being and reflect on how we can start to make changes in our lives – in how we eat and how we move, especially how to embrace exercise into our increasingly sedentary lives. That doesn’t mean we go the whole hog and jog around every port of call but what a cruise does give us, is time – and often the opportunity – to take stock of our lifestyle and think about the small shifts and changes we can make to our lives. We all recognise that movement, flexibility and balance are possibly the most important things we can do for our bodily health – neither will diet alone shift those disobliging pounds. Help is at hand, and it is possibly a deck or two below where you sleep, where an expert fitness trainer will show and devise a programme specially for you at a time when you are not rushed and able to try the various exercises and machines under a watchful eye. For instance on Princess Royal and Regal ships there is a special Body Sculpt Boot Camp which in 40 minutes helps increase energy levels and improve muscle strength and endurance and burns up to 700 calories. It’s not for wimps, but follow it and see results. It comes with its own take-home programme divided into four manageable workouts so that you can continue the good work. Also available on these are ships are TRX, Chi Ball Yoga and Spinning either in classes or private lessons. Add to that a state-of-the-art gym, a multi sports area on deck for virtual games of basketball, tennis and volleyball, a driving range and in the games lounge virtual table tennis with a Kinect TM system. It almost makes you want to lie down! Over on MSC ships, as well as group runs around the deck and a fitness area with all the most up-to-date cardio and weight equipment, there are Pilates, spinning or dance classes either in a group or individually> The latest exercise favourite, hydro-riding, is available on MSC Divina. It is basically spinning in the swimming pool on specially designed bikes! While most ships have outdoor jogging or power-walking tracks on decks, many now also have outdoor gymequipment – as on the Viking Star. You can exercise your abs, arms and glutes as well as do a little cross-training, all in fresh air. On all P&O cruises there is a wide range of sporting options with golf and cricket nets, deck courts for tennis and football while all the gyms are fully equipped with Technogym (the best exercise equipment) and some also offer Trixter X Dream Bikes. These are the very latest in exercise bikes. They come with their own screens so you can choose ehat you see and where you go, and should you so desire, you can even pit yourself against other riders in a virtual race. Not quite the Tour de France but exhilarating and great for core and muscle strength. It goes without saying that exercise classes are available throughout, with aerobics and yoga being twoof the most popular while dance classes, thanks to Strictly, are much in demand. On Hapag Lloyd’s Europa 2, guided bike rides are organised ashore, as are Nordic walking programmes and yoga classes on the beach. So seriously does this ship take its passengers’ fitness that it has a programme called BE YOU, designed by German Olympic skiing star Maria Hofl-Riesch herself will join certain cruises throughout the year and train alongside guests. Crystal Cruises also offers a host of exercises options – from dancing classes to spin, yoga and stretch, alongside the more specific bums, tums and thighs sessions. There’s also a Kinesis wall, which is one of the great ways to develop strength and flexibility in smaller spaces, and individual classes are on offer. As with most ships, private tuition with teachers and personal trainers is always available, but it is advisable to book early to get a time to suit you. Whatever ship you choose, it’s almost certain to have swimming pools where you can exercise on your own… which is why there are no excuses for not trying to stay fit while afloat.